And since things happen in threes! After the two superb vintage years of 2007 and 2008, 2009 stayed on the same track. Early ripening, perfectly health and fruity are just some of its major characteristics. Let’s remember some of the highlights of this year 2009. Despite a late budding due to harsh winter, the flowering started at the beginning of June, which is earlier than usual, thanks to a temperatures shooting back up again in the months of April and May. In general it went well, even for the fruit set. This lead of fifteen days was maintained despite a rather gloomy month of July. The month of August was hot and very sunny which guaranteed ideal conditions for grape ripening. August 31 for AOC Crémant d’Alsace. September 14 for AOC Alsace and AOC Alsace Grand Cru, for all the lieux-dits with some exceptions (Kaefferkopf, Bruderthal, Altenberg de Bergheim and Kanzlerberg, delayed for either 1 or 2 weeks depending on the parcel). September 28 for any Vendanges Tardives and Sélections de Grains Nobles indications. The days of September were very hot but the nights were chilly, especially near the end of the month, allowing a fine-tuning of the ripeness while preserving the aromas. The absence of any significant rain resulted in a slight brake of ripeness on the lighter soils, with even some water deficiency in certain terroirs. Nevertheless it should be pointed out that all grape varieties were in excellent health. Even hard for any wine-makers to remember the last time this happened! Consequently the harvest would be undertaken at will, allowing to pick grapes when perfectly ripe. 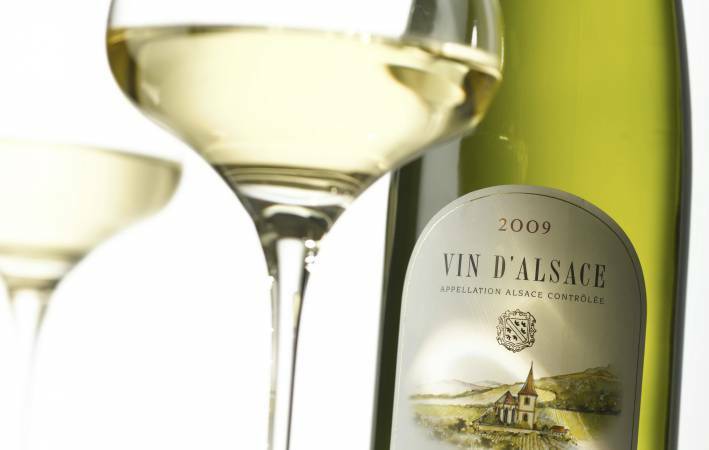 From a quantity point of view, the overall production amounted to 1,166,900 hl, an increase of 3.1% compared to 2008 (916,600 hl for AOC Alsace and Alsace Grand Cru and 250,300 hl for AOC Crémant d’Alsace). In general the wines have a decent alcohol level due to the high fermentative yield, but also sustained by great acidity. The 2009 wines can be consumed quickly. The coulure problems on Muscat from last year are a thing of the past. In 2009, they are very fruity and crispy. Sylvaner has perfectly-ripe white fruit notes. And all Pinot have excellent potential: White (fresh and aromatic), Gris and Noir (ripe and silky tannins). In 2009, Gewurztraminer are aptly named. Indeed at harvest time their skin was very thick and all the wines had particularly spicy and fruity aromas (Gewurzt = spices). Riesling features citrus and floral aromas. For this variety, the freshness is particularly interesting for wines produced on deep-soiled hillsides. The exceptional weather in October, together with the perfect grape health qualities allowed for a production of many batches of Vendanges Tardives, and even of Sélections de Grains Nobles. In 2009, these sweet wines are therefore naturally very marked by the raisining.